English Mastiffs are, quite simply, massive. The largest ever recorded by the Guinness Book of Records was a London-based champ called Zorba, who stood at an impressive 89cm tall and measured 251cm from tip to tail: about the same size as a small donkey (had he lived in a seaside resort such as Blackpool, perhaps Zorba might have made a small fortune giving rides to children). The Mastiff’s physical immensity is nicely balanced with a noble, docile and good-natured temperament, making them the ultimate ‘gentle giants’. And whilst they are not aggressive in the least, they do have a natural instinct to guard and will be protective of their owners and families. When Sir Piers Legh was wounded in the battle of Agincourt, his Mastiff stood over him for many hours to keep the enemy at bay. 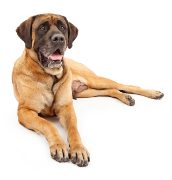 Having a deep chest, Mastiffs can be at risk of bloating and gastric torsion. These conditions occur after a meal, when the stomach swells and twists (and in extreme cases they can be fatal). You can help to prevent them by feeding your Mastiff several small meals a day, and restricting exercise after they have eaten. By joining this group you use the buying power you share with other English Mastiff owners to get a better deal on insurance. Currently, there is an offer available with MORE TH>N, so please join the group to find out more. "Thank you so much Maria, I am very grateful for all your support and help. You and your team provide a great service, one that I will be..."
"A lot cheaper than any other quote only problem we have it wouldn't let us retrieve it so we will have to go through it all again. " "It's easy to navigate the website and I get the best deal for my dogs' pet insurance. "